“Trusting math and software code (Bitcoin) is a better plan than putting your faith in humans (bankers)." "Bitcoin replaces, not improves, the current system. The same way electric lights replaced gas lights." 'Long Bitcoin, Short the Bankers.' Coined by Anthony 'Pomp' Pompliano, co-founder and partner at Morgan Creek Digital, a digital asset management firm, this catchphrase is now being used by the Bitcoin community whenever a bank or banker appears guilty of wrongdoing. But according to Pompliano himself, the phrase isn't really about encouraging people to invest in cryptocurrencies rather than stocks. Instead, its main aim is to argue that it's safer to entrust the world's money supplies to code than to people (e.g. bankers). And while this is certainly a controversial view for many people outside the crypto community, many of those within it are in full agreement. Anthony Pompliano first uttered "Long Bitcoin, Short the Bankers' in September, in a tweet that garnered over 1,000 likes. Since then, the phrase has come to be used by any Bitcoin or crypto supporter wanting to draw attention to the misadventures of the global banking system. In November, one Reddit user used it in reference to Deutsche Bank, which had its offices raided by police in Frankfurt as part of the investigation into the Panama Papers. One Twitter user repeated it in December when Wells Fargo agreed to pay a USD 575 million fine for creating millions of fake accounts, while Pompliano himself used it once again in January when four former Barclays executives entered court under charges of fraud. Also, this week, it had a chance to be used when the European Central Bank was unwittingly boosting the case for cryptocurrency adoption. 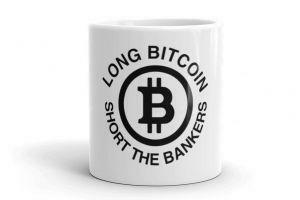 The phrase is now so fashionable that CNBC started using it in promos in January, while Pompliano himself and some online retailers are selling "Long Bitcoin, Short the Bankers" t-shirts. However, while the slogan itself might suggest that you should open a big long position in Bitcoin and short shares in, say, Wells Fargo or Barclays, Pompliano tells Cryptonews.com that it was more about highlighting the failures and unreliability of the financial industry. "This has nothing to do with investments," says the Morgan Creek Digital Founder, "but rather it is the belief that trusting math and software code (Bitcoin) is a better plan than putting your faith in humans (bankers)." The aforementioned scandals reinforce this view, and while crypto has had its own fair share of scandals, Pompliano firmly believes that these are eclipsed in scale by the traditional financial system. 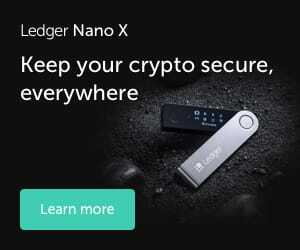 "It is a fact that there is more crime and bad acting in the legacy financial system, compared to the crypto system," he says. "Bloomberg recently reported that approximately USD 2 trillion is laundered annually in USD and we have seen headline after headline in the last 6 months about the billions of dollars of fraud and nefarious activity facilitated by legacy banks." Other analysts second this damning judgment. Financial analyst and Bitcoin bull Max Keiser tells Cryptonews.com that the whole legacy financial industry is tainted by corruption. "The model of traditional banks is to keep 90 cents of every dollar stolen, with 10 cents going to pay fines orchestrated by captured regulators," he says. "I can’t think of a single bank in the world that’s not guilty of fraud and malfeasance in some way." It's not really controversial to assert that the global banking system has serious problems with corruption and criminality. The question is, is 'Long Bitcoin, Short the Bankers' correct in implying that crypto could reduce such corruption and criminality? Pompliano seems to think so. "Law enforcement wants criminals to commit crimes with their hands on a keyboard," he says. "The use of transparent digital currencies will actually reduce crime over time in my opinion, which should be encouraged by all market participants." By providing a public ledger of all transactions and address, cryptocurrencies such as Bitcoin and Ethereum should in theory reduce money laundering. And this would seem all the likelier if, like Max Keiser, you believe that crypto will end up replacing the existing fiat-based financial system, rather than merely complementing it. "Bitcoin replaces, not improves, the current system," he says. "The same way electric lights replaced gas lights." Of course, economists and analysts sitting outside the industry aren't so confident that Bitcoin or any other coin will do much to reduce corruption. In an article published in December, Harvard economist and cryptocurrency sceptic Kenneth Rogoff argued that cryptocurrencies would rather have the opposite effect. "Any single large advanced economy foolish enough to try to embrace cryptocurrencies, as Japan did [in 2017], risks becoming a global destination for money-laundering," he wrote. Japan did in fact witness a tenfold increase in crypto-related money laundering in 2018, with suspected cases rising from 669 to 7,096. Still, there were 417,465 reported cases of money laundering in total in the country in 2018, representing an increase of 17,422. These figures are palpably superior than those for cryptocurrency transactions, strengthening the view that the fiat-based system is more corrupt than its crypto-based counterpart (particularly when many crypto-exchanges still aren't even regulated). This therefore supports the philosophy underlying "Long Bitcoin, Short the Bankers," which Pompliano affirms has grown in stature precisely because it strikes so many people as true. "I randomly tweeted the phrase one day and people liked it," he explains. "After using it a few times, it has taken on a life of its own. The secret to great marketing messages is to simply tell the truth. People are attracted to the things that resonate with them and it appears "Long Bitcoin, Short the Bankers!" is one of them."